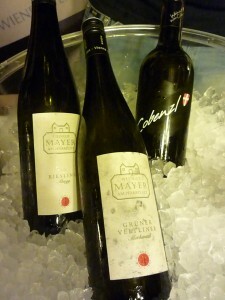 Last post we left off with the Austrian Wine Technical Tasting for Day 1 of the European Wine Bloggers Conference (EWBC) ... 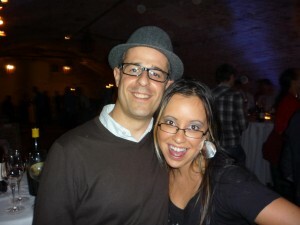 So what do you do with a restless/loquacious crowd of 200+ wine blogger/professionals? During the tasting, some people were using the spittoons while others chose to ‘fully experience’ the Austrian wine being served at the tasting, in any case, after 11 wines the crowd was growing restless and loquacious (aka they were blabbing their mouths!) Wine certainly has a way to get the words flowing! 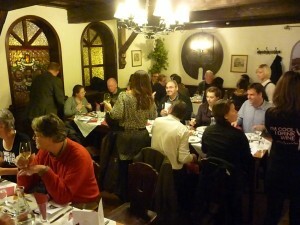 So what do you do with a restless/loquacious crowd of 200+ wine blogger/professionals … well ya bus ’em to a heuriger (aka Austrian wine tavern) to drink EVEN more wine of course! 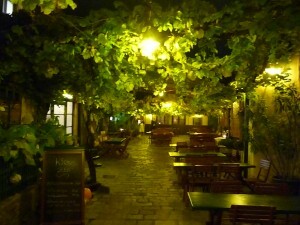 Just in case, heuriger is pronounced: hoy-riga. 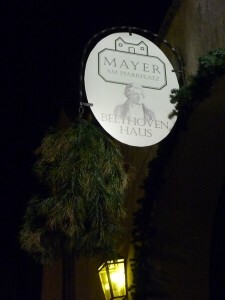 This heuriger is called Mayer Am Pfarrplatz and this wasn’t just any heuriger … it is the heuriger where Beethoven lived and composed most of his 9th back in 1817!! Who wouldn’t want to compose music here? Especially with the delicious Austrian wine to get those creative juices flowing? Oh, and for those of you thinking … “Beethoven’s 9th?? ?” … don’t worry, I got your back! ;) Didn’t know you’d be getting a music lesson today, did you? 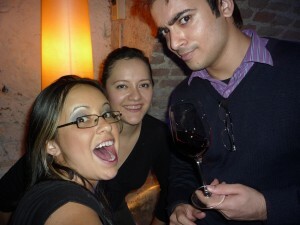 Once we arrived and all 200+ wine bloggers took their 2,000+ photos, the wine ‘tasting’ commenced. Now when I say ‘tasting’, I am mean more the ‘full experience’ tasting, i.e. no spitting! The wine bloggers were THIRSTY and no amount of water just was going to quench that. 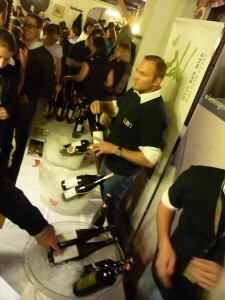 There was a wine bar set up with the sponsors, WienWein, pouring out hearty servings of their wines. I don’t think they quite expected the onslaught on wine bloggers that poured into the heuriger like a herd of stampeding cattle. 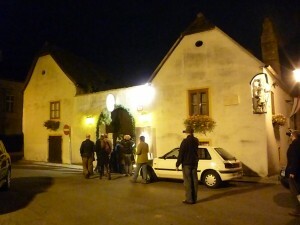 I can still remember the frightened look in their eyes as the crowds of wine bloggers placed their coats on their seats, picked up their wine glasses, and headed to the wine bar like zombies from ‘Thriller‘. Poor things, they never stood a chance. It is no surprise that they realized the potential in hosting an event for 200+ international wine bloggers, who would spread the word, that wine produced in Vienna is fantastic and ready to make its presence known on the international market! 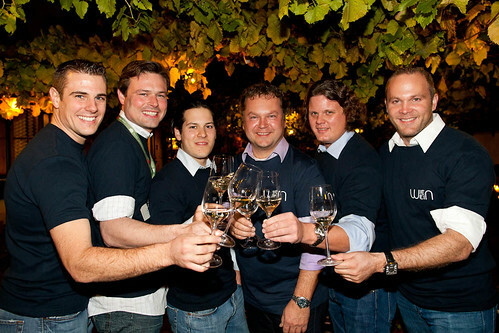 It is no surprise that they realized the potential in hosting an event for 200+ international wine bloggers, who would spread the word, that wine produced in Vienna is fantastic and ready to make its presence known on the international market! 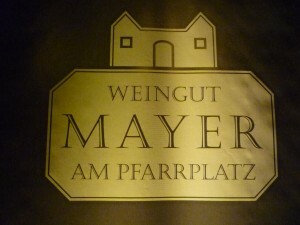 For the names of the wines that we tasted at this WienWein sponsored Heuriger Night, you can click this link to view them on Adegga (a social tasting note site). So the wine was flowing and so were the conversations, laughter and good times! 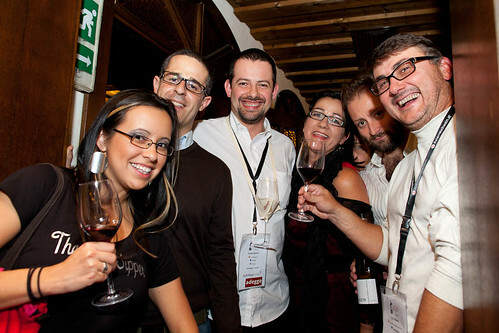 It is just such a crazy and wild recipe to mix wine and a bunch of wine bloggers who spend most of their virtual relationships communicating in 140 characters or less … we begin to talk at about 140 characters per second! And you should see how some of us wine bloggers think we can talk with multiple people at the same time when we are face to face! Its like we think its a real life computer screen with 4 different Skype chat boxes blinking orange! …. I know that metaphor was probably way to geeky for some of you … but that’s just who we are okay! =) Give us free WiFi and ample amounts of power outlets and NO ONE GETS HURT! So after an hour or so of mingle time, the food was served! 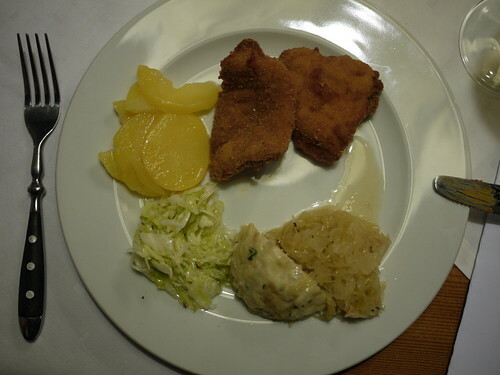 Trays of delicious meats, sausages, potatoes, sauerkraut, cabbage, cream dips, and wiener schnitzel were delivered to our tables! I really did try to eat as civilized as I could, but eventually the Texan in me just came out and before I knew it I was eating with my hands, napkin tucked in like a bib, and elbow deep in meaty goodness! Sometimes I feel like forks and knives are can be overrated. 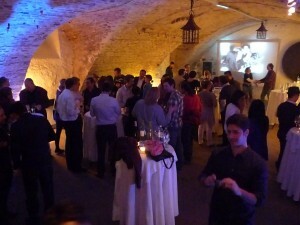 After I cleaned myself up from my beast-like meat devouring … it was back to the wine ‘sampling’ and mingling! 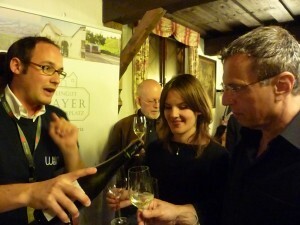 People to meet and wines to taste! 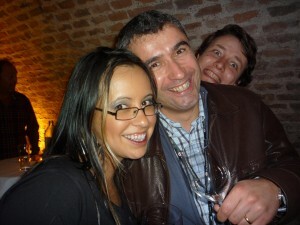 Me with the Adegga boys, the lovely lady whose name I am drawing a blank on, The Wine Chap and The Wine Hub. I am not sure the “YOU MUST COME” part was there, but that is my story and I am sticking to it. The after-party opened with the Viennese Waltz … I must remember this idea for my next party! A slideshow of the night was projected on the wall, more wines were being poured … I decided that if I was going to make my 6:30am wake up call, I needed to stick to one wine for the after-party. This one was my choice. Such a delightful wine! That and the name made me chuckle … if I have to explain it to you, then nevermind. Not much else for me to remember from the night. I just remember lots of dancing, laughing, and as usual when I am tipsy … I was taking photos with everyone, lol. Ah! 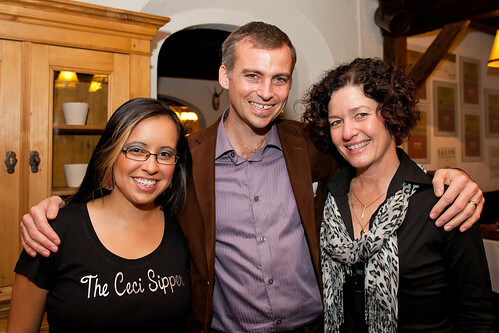 Such a wonderful first EWBC soiree! It is just amazing to me that the people I know from the wine online world turned out to be such incredible people face to face! I am so happy to be one of those crazy people who decided to use their free time to start/write a wine blog. It really has changed my life … in the most amazing way possible! I´m glad you documented everything so well as my table was more interested in nicking wine from the Wien Wien guys and seeing how fast we could drink it. Looks like we all had a great time! ;) Thanks for the reminder! Hahahaha! After our ‘back of the bus’ laughters I can only imagine the nicknaming was hilarious! LOL!